Indigenous social housing providers want the federal government to rethink plans. 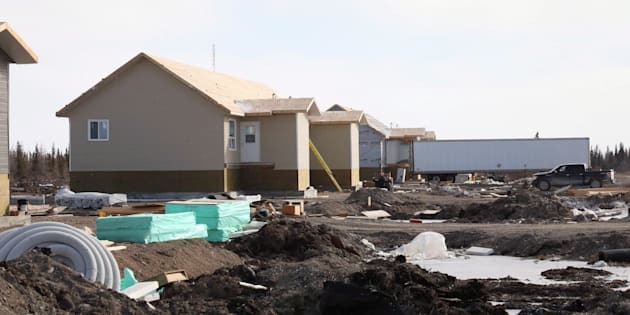 Housing under construction is seen in Fort Severn, Ontario's most northerly community on April 26, 2018. OTTAWA — Indigenous social housing providers will soon push the federal government to rethink plans to overhaul their funding arrangements because they worry the Liberal proposals could leave thousands of low-income families on the street. Federal officials are set to start consultations on how to spend almost $500 million in the coming years as federal operating agreements expire and a new funding scheme is put in place to subsidize rents. The hope is that housing providers will shift to new funding models that make them less reliant on federal cash to operate. Even though Indigenous providers make up a small portion of the social housing covered by the agreements, those in the sector say they are less able to become self-sustaining than their larger counterparts who serve a wider population. Justin Marchand, executive director of Ontario Aboriginal Housing Services, says his organization has been diversifying revenue sources, but that takes time and is easier for larger providers with the necessary resources and assets. Frances Sanderson, executive director of Nishnawbe Homes in Toronto, says many Indigenous housing providers would have to fold without the operating agreements, leaving thousands with no place to live.